An important exhibition that explores Norman Rockwell’s unparalleled role as an American icon-maker and storyteller will be on view at the Newark Museum from February 28 through May 26. The exhibition American Chronicles: The Art of Norman Rockwell is organized by Norman Rockwell Museum, Stockbridge, Massachusetts. Norman Rockwell (1894-1978) painted the best of America, creating indelible images of the lives, hopes and dreams of Americans in the 20th century. Expertly weaving both narrative and painterly images, he was a consummate visual storyteller with a finely honed sense of what made an image successful in the new, rapidly changing era of mass media. 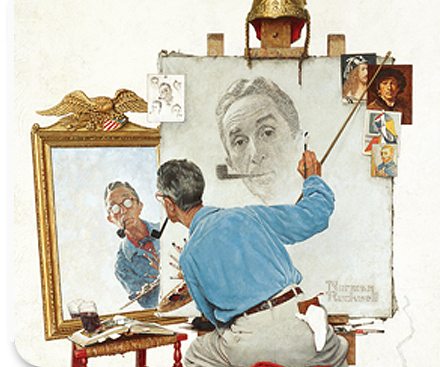 Rockwell’s unique artistic legacy, established during 65 years of painting, offers a personal chronicle of 20th century life and aspirations that has both reflected and profoundly influenced American perceptions and ideals. American Chronicles traces the evolution of Rockwell’s art and iconography throughout his career from carefully choreographed reflections on childhood innocence in such paintings as “No Swimming” (1921) to powerful, consciousness-raising images like “The Problem We All Live With” (1964), which documented the traumatic realities of desegregation in the South. Commentary focusing on recurring personal themes, artistic and cultural influences, and the commercial climate that influenced Rockwell’s creative process will be woven throughout the exhibition. For more information go to http://www.newarkmuseum.org.